Bates Motel kicked off its fifth and final season last Monday and it so far has left this writer conflicted. I have been anxiously awaiting the arrival of the new season since the minute Season 4 ended, yet I am sad that my favorite show is nearing its ultimate conclusion. This recap will catch you up with last week’s premiere and last night’s 2nd episode with a new installment coming every week. Over breakfast, Norman tells mother how his hanging of the new shower curtains in the rooms has made him want to repaint the motels exterior and that he will head to the newly-reopened hardware store in the village to pick up supplies. Norma replies with disappointment that she cannot go to the village with him. Norman reminds her that he understands that she doesn’t like having to stay inside, but it’s what they signed up for and that “at least it’s paradise, right?” The two have a Bates Motel signature uncomfortably long and intimate moment before Norman is out the door and Norma vanishes into thin air (the vanishing of Norma will be a repeated theme throughout the episode, if not the season). The color pallet and overall tone shifts to the cold blues and darkness. Throughout the series, they have always used color the maximum potential to really give the viewer the full experience of the tone and mood of the characters and situations and it is HIGHLY appreciated. We now find Norman in the newly-opened hardware store, which is dotted with taxidermy one can only assume is leftover from Norman’s taxidermy mentor and Emma Decody’s father’s shop. As the camera moves around the shop, it becomes fixed on a blond, fair-skinned woman in a vintage dress who bears a striking resemblance to a younger Norma. This again makes you question whether she is a figment of Norman’s imagination. Kudos to the casting agent for nailing it with this character, Madeleine Loomis (nods to Psycho‘s Sam Loomis). In a jarring juxtaposition, we next see Dylan manning the grill at a party at his home with his girlfriend and now, the mother of his child. He is happy, healthy and settled. It is a far cry from the withdrawn, brooding man we knew before. Sadly, he can’t escape his family and Caleb (Dylan’s father/uncle) shows up unannounced and uninvited at their new home. Caleb is a complex character and I have always really enjoyed Kenny Johnson’s portrayal of him. Here it is almost as if Caleb is the child and Dylan is the parent. It’s an interesting change in dynamic and one that Johnson captivated flawlessly. A really heartbreaking moment occurs when Norman tries to piece together where he got the wallet of a strange man that he found in his pocket. 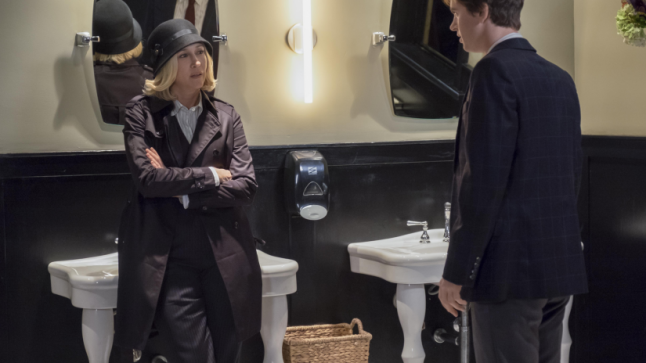 Norma is being her usual evasive self, so Norman tries to balance the books and solve this by checking the guest registry vs. his “blackout” journal and vs. his credit card statement. It’s been a really wonderful journey to watch Freddie Highmore grow into this character right before our eyes over the past four seasons while also portraying the decline and devolution of Norman. The end of the episode reveals the owner of the mysterious wallet Norman had… and who is dead in the freezer in the basement. It’s a great cliff-hanger for next weeks episode. This episode starts with a fantastic scene that is a prime example of the incredible tension that can be created between two seasoned actors with very little dialogue. The face-off between Norman and Sheriff Romero is a prime example of using tone and expression to show the shift in dynamic and power in ways more powerful than the accompanying narrative ever could. That shift is kind of sad to watch, though it pleads a good case for the reality of karma. Sheriff Romero, the authority who was once above the law, has been reduced to a punching bag for Norman and the inmates who are now his peers. Guaranteed to have you glued to the screen. This episode’s shining star is really everyone that makes up the ensemble cast. Of course Freddie and Vera are great, but it’s the supporting characters that stood out the most to me, here. Even in death, Norma still has Norman under her thumb. So it surprised me when Chick showed up at the house with a business partnership proposal for Norman, that Norma didn’t pipe up and squash that on sight. Chick has always been a character that piqued my interest, so I am glad to see him back this season and curious as to where his character will go. Ryan Hurst’s portrayal of Chick is interesting and quite delicate, yet the character is so rough around the edges. The character is so unique that if there was a spinoff show that centered on him, I would watch it in a heartbeat! Caleb is painted in a sympathetic light in this episode. Watching him break down at Norma’s grave, shortly after learning of her “suicide” is heartbreaking. In fact, watching him go through the entire range of grief is interesting as it’s the most emotional we have ever seen him. His vulnerability turns to rage when he breaks into the Bates’ home. The rage turns into horror and disbelief when he comes across Norma’s very blue corpse in the basement room that Norman has turned into a makeshift shrine – a shock of horror that finally ends with a “lights out” when Norman, dressed as Norma, knocks Caleb out. It will be interesting to see what happens with this situation when Caleb wakes up, especially since Chick has now seen everything. Will he be the next to go? The season opener teased that Marion Crane would make an appearance in this episode, but a tease was exactly what that was as she makes no appearance whatsoever. However, we do learn who “David Davidson” actually is, so it would lead one to believe that Marion is just around the corner. Stay tuned for more Bates Motel recaps next week!